The Crown will store your current Standing Stone power, which will be removed if you choose a third one. For example, if you have the Thief Stone power and then choose the Warrior Stone, the Crown will store the Thief Stone power, as it was the one that was removed. The Crown will add the stored Standing Stone power to your active effect list. So if you want to change your Standing Stone combination without losing the power stored in the Crown, simply unequip the Crown and then activate the Standing Stone to get the power, after that equip the Crown again. Provided that you don't have Lycanthropy, you can keep normal resting bonuses while using The Lover Stone by unequipping the Aetherial Crown (containing The Lover Stone) before sleeping and re-equipping it after obtaining the resting bonus. This can be combined with one of The Guardian Stones for maximum benefits. If you give the Crown to a follower, its stored effect will not work on the follower. This item is fully permanent. 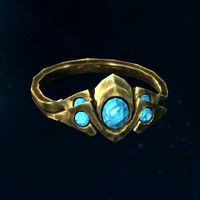 The Aetherial Crown can be tempered with a Dwarven Metal Ingot, but since it has no armor rating, tempering increases only its value. This issue has been addressed by version 1.1.4 of the Unofficial Dawnguard Patch; the crown can no longer be tempered. If you are an Argonian or a Khajiit and have the Ancient Shrouded Cowl or the Worn Shrouded Cowl, you can equip the crown and the Cowl, then switch the helmet spot and the crown will stay and the effect will still be active. If the Lord Stone is stored, sometimes equipping and unequipping the crown will cause the armor increase to happen after the crown is removed, and decreased (returned to normal) when equipped. ? Equipping the crown may not grant the stored stone bonus. Unequipping it (which will remark the stone effect was removed even though it was never really added) and re-equipping it should fix. Going to the previous stone, selecting the stone and waiting for the beacon to fade away before fast traveling to the second stone may fix it. Standing stone Greater Powers (use limited to once-per-day) stored in the Aetherial Crown can be used any number of times per day by unequipping and re-equipping the Aetherial Crown. This page was last modified on 15 February 2019, at 01:54.